Serviced this Fisher EZ-V Plow. Hose routing looked wrong. 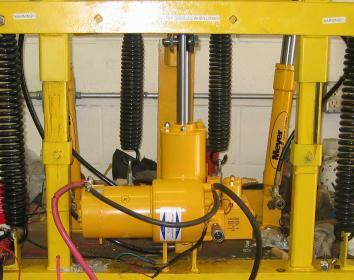 Especially the hose to the lift cylinder being turned so sharply. Contacted Fisher and sure enough it was. Made corrections. Forecast on 12-2-07 was for 3 - 6". Even though it was Sunday, we opened at 7AM, and stayed until 11:30PM. When we say we are "Open During Storms", we mean it! We ended up with about 3" here. Kept busy the whole day, but not backed up, which is good. We were able to get everyone out the door as fast as possible. Pics coming later this week. 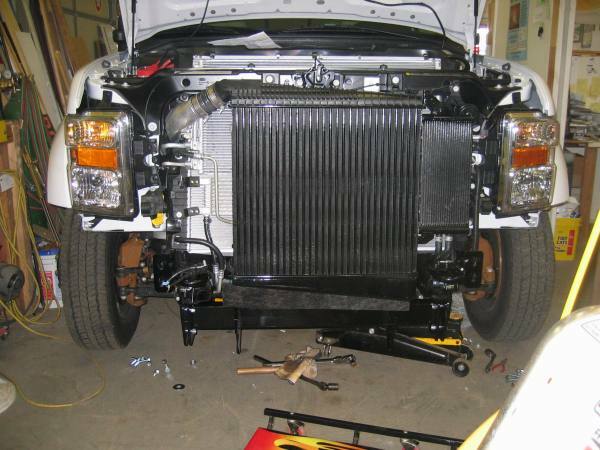 This week we finished up the rebuild of the ST-90 plow, and installed it on a 92 GMC 1500. We also installed a rebuilt E-47 pump on the truck. This truck has a custom made mount, that while it is very strong, it too put the plow too far out in front of the vehicle. 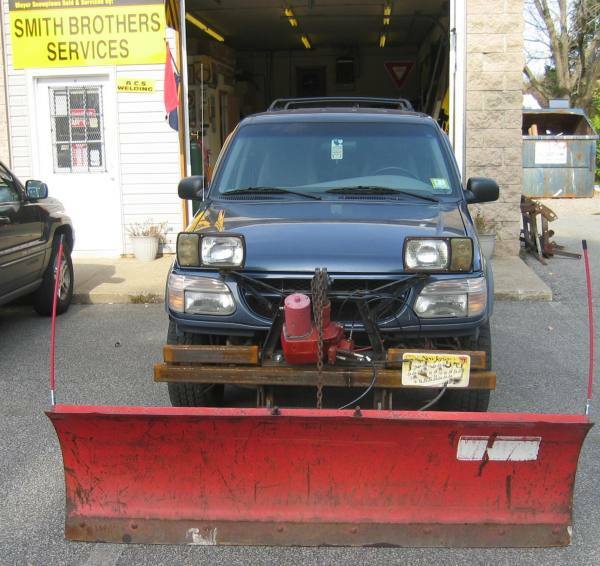 The plow looks great, has a new Sector, Trip Springs, Angle Rams, Hoses, Couplers, and Guides. 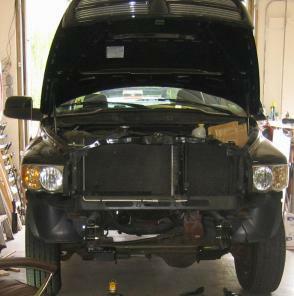 We also installed a used C-8.5 MDII mount on a 2008 F-450 Crew Cab Dually. This was the hardest install yet. 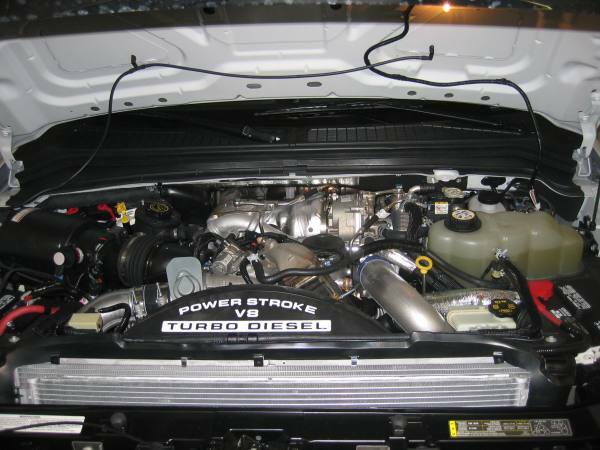 The Powerstroke and accessories leave no room under the hood. The new 2008 electrical requirements make what used to be easy wiring connections difficult. There is so much jammed under the hood there is little room to run wires. Even with plow prep there was no grommet in the barely accessible firewall to pass the control harness through. 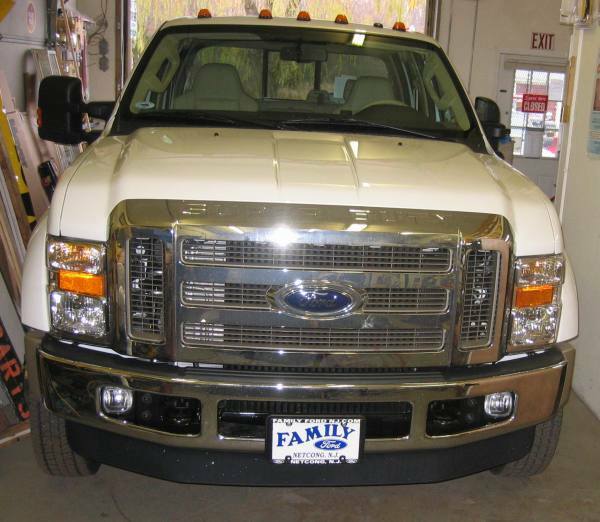 Very nice truck, very HD, but not easy to work under the hood. We also rebuilt an early design E-47 pump this week. Kept busy this week. 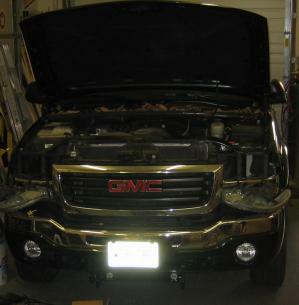 Serviced a Western on a Chevy, went over an old cable operated Western pump and wired up the lights on a 2000 Ford Explorer. 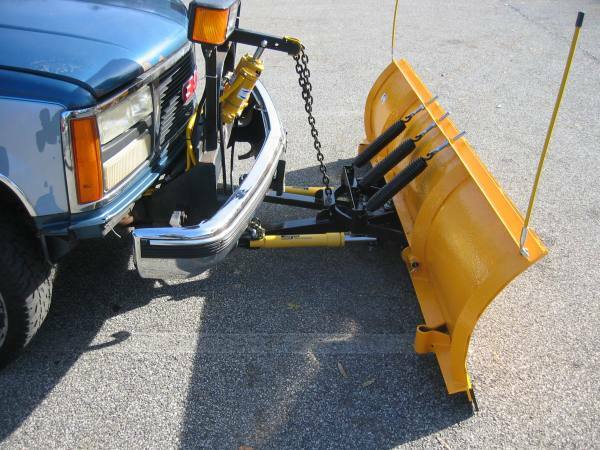 Plow is way too heavy for the truck, and the custom made mount (we did not build) puts the plow too far out in front. Well trucks are out plowing, and we opened @ 8am today. We came in an hour earlier than normal. I bet the guy that called looking for a $500+ PA Block was glad he came in with his pump. Bet he was real glad to hear he only needed a $10 ground cable to fix his problem! It is much easier to diagnose pump problems in person, but we do try on the phone when fielding calls.... from NJ as well as Michigan, Ohio, Indiana, Illinois, Massachusetts, Iowa, and Delaware! First plowable snow forecast for today into tomorrow. Initial reports were for 4 - 6". Even though it was Sunday, we were open from 10am - 4pm. We reopened from 9pm - 1am. All calls forwarded to cell when we left the shop. When we say "Extended hours before, during, and after storms" WE MEAN IT! October - We kept busy! The above tools are selling steadily in our Store. Click on any of the above pictures to go there. 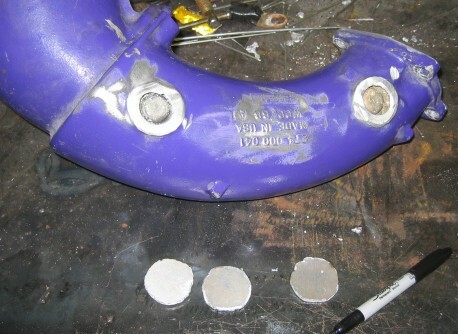 The Diagnostic Tool (First picture) is a custom made tool we invented to diagnose problems with Meyer E-47, E-57, and E-60 Snow Plow Pumps. 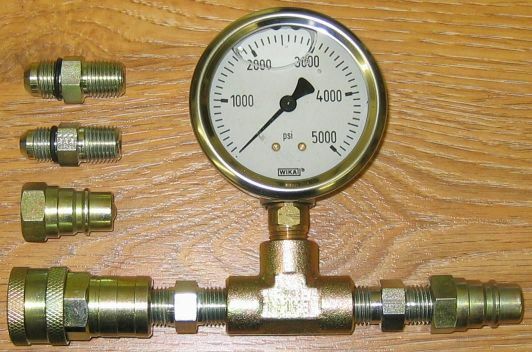 It allows you to operate each valve independently, and check each valve for proper operation and magnetism while the pump is mounted on the vehicle. 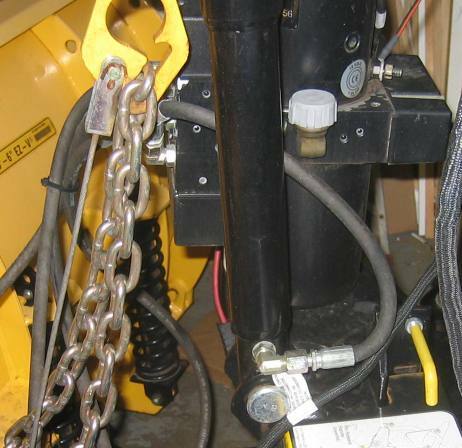 It will also let you know there is a problem with your truck mounted control and / or wiring if the pump works with this tool connected in place of your truck mounted controls. Easy to connect. 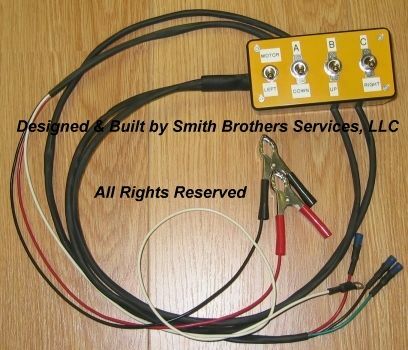 Unplug the 3 coil wires on the pump from the truck harness, and plug the three in to the 3 wires from this controller. Disconnect the white trigger wire from the motor solenoid mounted under the hood, and connect the white wire with the ring terminal from this controller. Connect the clips to your battery, STAND TO ONE SIDE CLEAR OF THE BLADE, and you are all set. Look for an emergency controller that can be used if a Touch Pad, Slik Stik, or toggles go bad, in the very near future in our store! We will also have adapters to use this Diagnostic Tool with the Meyer E-58 Snow Plow Pumps that have 2 wires going to each coil. 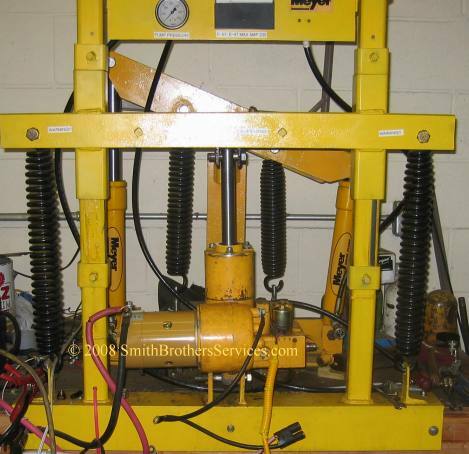 Smith Brothers Services, LLC is dedicated to bringing the industry unique useful products that cannot be found anywhere else, or with features that cannot be found anywhere else. Recon Floor Covering (our next door neighbor) had a Grand Opening BBQ in the parking lot for all their contractors and vendors. A great time was had by all. We donated some Meyer hats, Meyer key chains, some Fluid Film, and some pens. ACS Welding donated some ACS Welding hats, and some pens for door prizes and give-aways. First thing in the morning a customer brought in a liquid cooled exhaust manifold off a jet ski. The freeze out plugs were eroded and leaking. 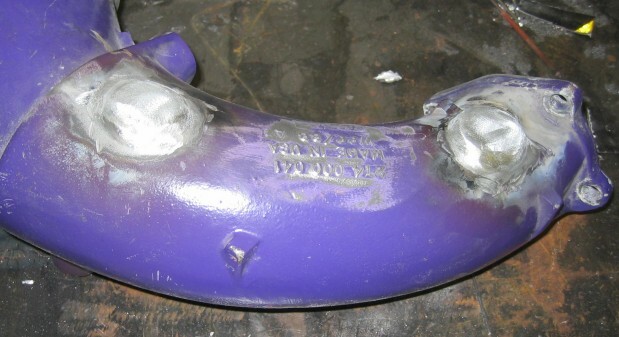 He prepped the manifold, and wanted us to weld aluminum plates over the holes in the cast aluminum manifold. So we cut some circles, and TIG welded them on. 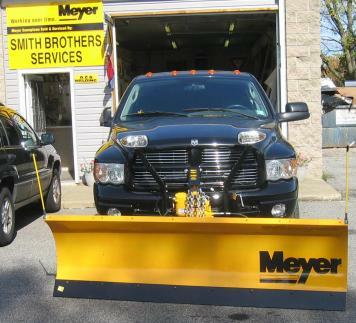 We are officially a Meyer Plow Dealer! We had a great time visiting the Meyer factory and Cleveland (6-6-07 - 6-7-07). We enjoyed a Cleveland Indians game, dinner buffet, with transportation provided to and from the hotel. Continental Breakfast, then we had a great time listening to where Meyer is headed in the future, and got to see the unveiling of the Drive Pro plow. Then we had lunch thanks to Briggs & Stratton and Whelen at the hotel. From there it was off to the Meyer factory for a tour and a look at what changes have been made to existing products, and what can be expected in the future. We followed the process from a sheet of steel to a finished plow, right down to the Shipping Dept. We then headed back to the hotel, again with transportation provided, for a brief rest before heading out to the Rock n' Roll Hall Of Fame for dinner. We had it all to ourselves for 4 hours! MANY thanks to Meyer Products and Swenson for a memorable, and enjoyable 3 days! This week we are heading out to the factory for a tour. Can't wait to see what they are up to! For the 2007 - 2008 Season we will be offering a limited number of Rental Units to limit your downtime! We are going to be an Authorized Meyer Plow Dealer and be able to perform Meyer Warranty repairs in the very near future. We are very excited about this. Additionally, it will allow us to offer the full line from Meyer Products to our customers. 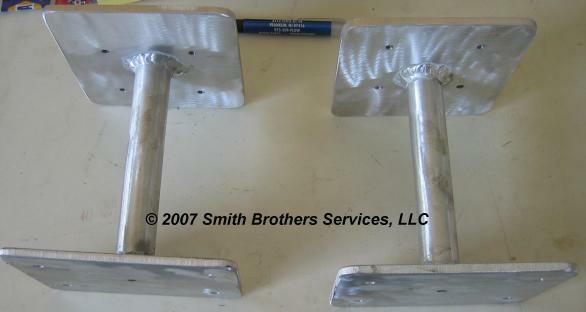 A customer came in and wanted a set of downrigger mounts TIG welded for his boat. Click on the pic for a larger view. Another E-47 rebuild, and A Frame repairs. A customer came in and wanted a cooler rack on the front of his truck. 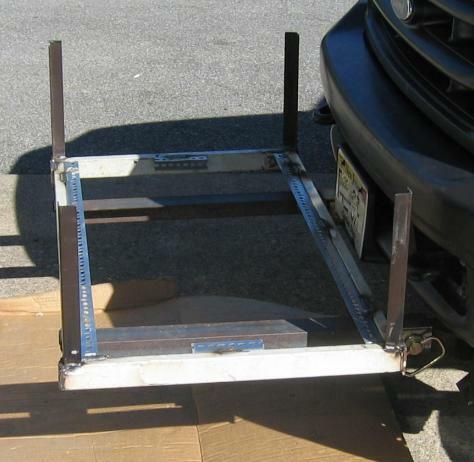 He wanted two receiver tubes attached to the frame, but he already had a Fisher Plow mount on the truck. 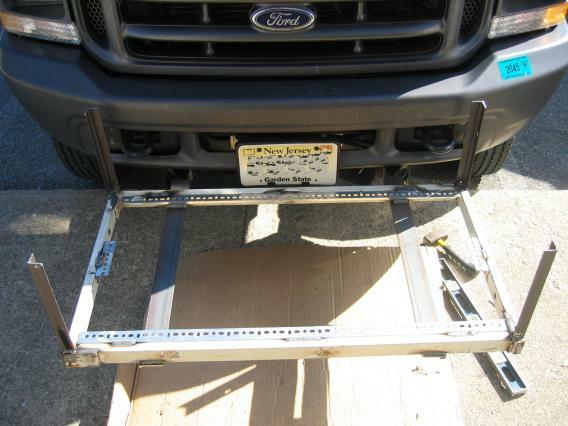 We fabricated the rack to fit onto the Fisher mount. Click on the pictures for a larger view. 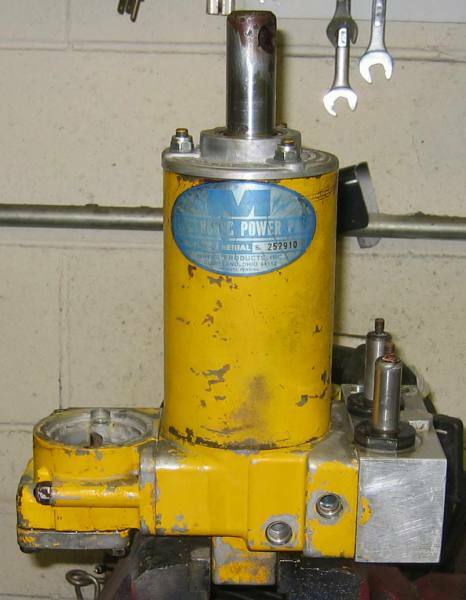 A customer brought in a used Meyer E-47 pump for a rebuild. What we found was somewhat shocking! 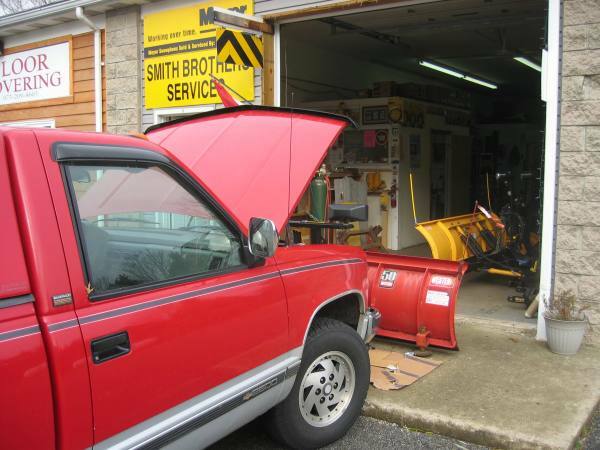 A customer brought in a Meyer ploy plow for a pump rebuild. We also found A LOT wrong with the A Frame. Meyer Pivot Pin Repair. We cut out seized Pivot Pins, and hopefully made it so they will never seize again. Added pics to the site of the above E-47 rebuild, and the E-57H and the work done to the plow. Looks like it might be a "white" Easter! Keep an eye on the weather this week guys!!! 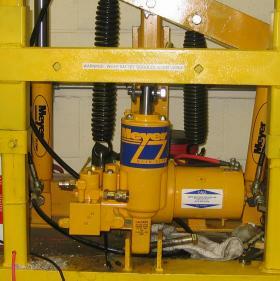 We rebuilt a Meyer E-57H Power Unit. 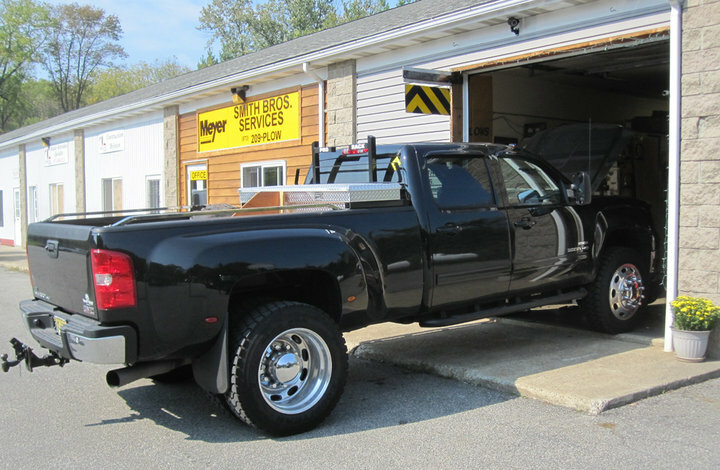 It was mounted on an EZ Mount Classic Lift Frame. 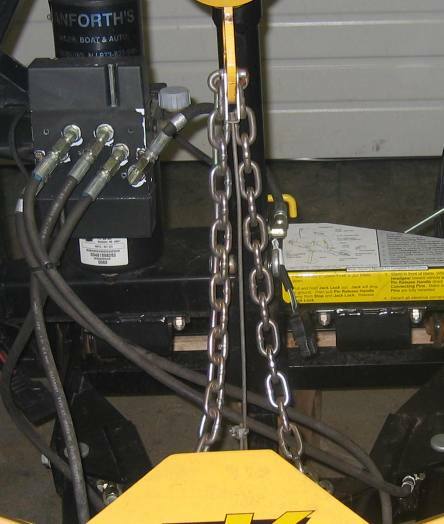 This is not the correct power unit for this lift frame. These pics will show why, and some more of what was done to the plow and power unit. We rebuilt a Meyer E-47 Power Unit and took lots of pictures. We stayed open from Friday morning until 10am Saturday morning to be here to meet our customers needs. By 8 on Friday night there was 8 - 10" on the ground. We had the coffee on all night, kept the lot plowed and the walk shoveled. Not sure what was different, but for some reason we sold out of Western plow skid shoes tonight. Closed at 10 on Saturday and forwarded all calls to cell phone. Sunday... we were at the shop from 11 am until 4:30 pm to help you all get ready for tonight. Went back to the shop at 7:30 pm and stayed until 12:45 am. Will be back early tomorrow am. From the calls today it seems many of you thought winter was over. Not so fast... Another big storm on the slate for this coming weekend. Be prepared! We are in the process of designing a set of wings that will turn your plow into a box plow. Stay tuned for updates! Another E-47 rebuild today. Plow would not raise or lower, or angle. Found lots of air and ATF in the system. Previous owner wired plow controller to constant power instead of key on power. New owner left plow on "float" overnight. It killed the battery and melted the A Coil to the A valve. During rebuild found 3 strands holding wire from C coil. It broke off when I held it up to show the customer. Looks like another chance for a big storm next week. 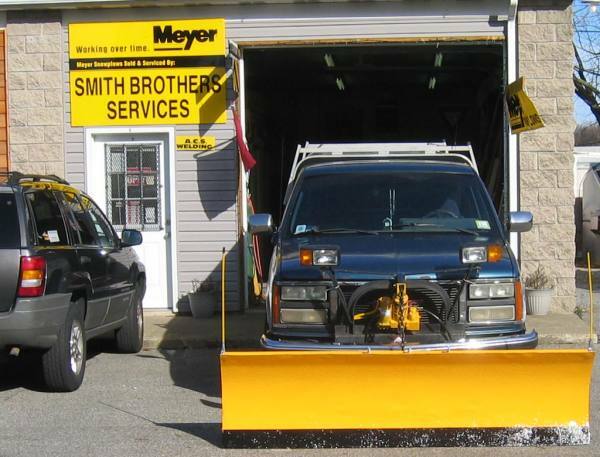 Make sure your plow is ready, and cross your fingers! We plan on opening an eBay store for our parts inventory, and due to many requests, to make Fluid Film available for purchase here on our site. We are getting a blizzard as I type this. 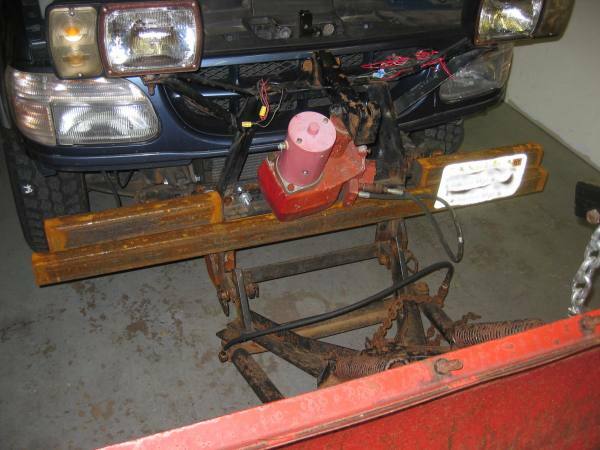 It didn't start out too strong, but while we were putting this plow back together, it really picked up out there! This plow came apart while plowing. 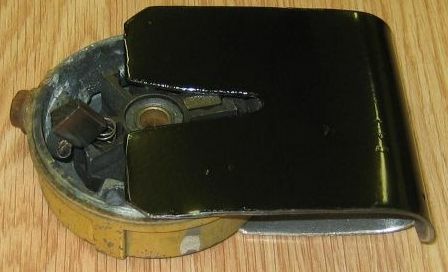 The king bolt worked loose, which accelerated the wear to the point the steel cracked, and probably sheared off the bolt. While it was here we also did a nearly complete rebuild of the E-47 power unit. It took 4 hours to fix the A Frame and service the pump. The inside of this one was not too bad considering it was missing two filters when we opened it up. You can clearly see that by just draining the fluid (as we did) that you cannot get all the sludge out. It must be disassembled to do it properly. Closed at 12:30 tonight. All calls fwd to cell after closing. You can call us anytime! Advice is free. Stayed open until 1 AM tonight. Sleeting pretty good out there. We are committed to being here when you need us most! Our new Test Stand is almost done. We are setting it up to test Meyer plow pumps for now. We will be adapting it to test other brands in the future. We are also considering marketing it to others.